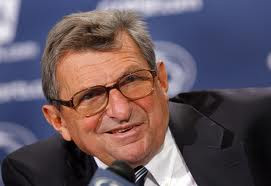 Joe Paterno goes for his 400th win as a head coach. I hope he can coach until he hits 1000. I still don't know who is starting at QB for Penn State but this game is all about Joe Paterno's remarkable career. We will never see another coach in D1 football get a chance at 400 wins in our lifetime. It's a good time for the milestone because PSU is playing their best football of the year. Because of the hype surrounding JoePa, I doubt the players are looking ahead to next weeks game at Ohio State. Northwestern is 2-2 in the conference with wins over Minnesota and Indiana and losses to Purdue and Michigan State. They should have beat MSU but turned into Northwestern at the end of the game. Some things never change. I say we trade NU to the Big East for Pitt or West Virgina.